Uruguayan striker Luis Suarez rescued his team from a one goal deficit. He scored twice to turn this tie against Atletico in Barcelona’s favour on Tuesday night. But the South American striker was lucky to be on the pitch at all. Atletico went ahead through Fernando Torres as the former Liverpool forward made it 11 goals in 17 games against the Catalan club. However, he then left his side with it all to do after picking up two needless yellow cards in the space of seven first-half minutes. That all but ended the visitors’ hopes in attack and the second half was all about Barcelona. Luis Enrique’s men duly dominated as they would be expected to, but ultimately secured a hard-fought win thanks to two goals from Suarez, who twice could have been shown a red card himself. Atletico’s hot-headed tactics have often cost them and Diego Simeone’s side have twice ended up with nine men in this fixture over the past 15 months. However, this time they could consider themselves unfortunate. Because although Torres’s dismissal was fair, Suarez should have followed. Torres was booked for hacking Neymar and then saw yellow seven minutes later for clattering Sergio Busquets from behind. It was a clumsy challenge and he could few complaints, even though the Barca midfielder made the most of it with the referee in close attendance. On the sidelines, Simeone was furious. Again, he had seen his side reduced to 10 men against Barca. Playing on the edge, Los Rojiblancos had lost their discipline once again – and they went on to pick up six more yellow cards as they employed any means they could to keep the home side at bay. But Barca’s pressure was almost relentless after the break and Suarez levelled the scores when he diverted Jordi Alba’s mishit shot into the net after 62 minutes. By now, the Catalans’ comeback was well on track and 12 minutes later, the Uruguayan headed home to make it 2-1. However, he had been fortunate to escape after viciously kicking Juanfran in the area in the first half and, with the scores at 1-1, grabbing Filipe Luis by the neck. Two aggressions that each could have brought straight reds. Instead, however, he received only a yellow for the second action – and went on to win the match for Barca. 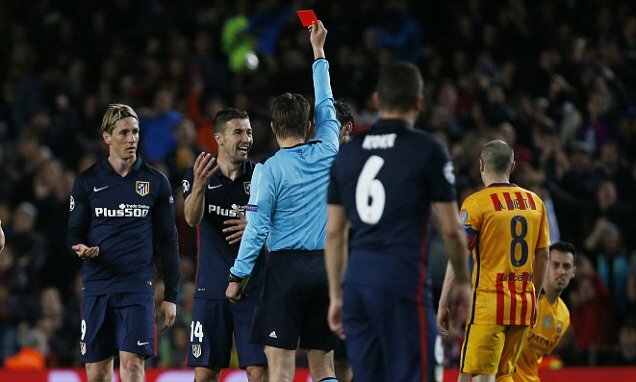 While Torres had committed his offences in front of the referee and annoyed the official by protesting his first yellow, Suarez was sneakier as he got away with his misdemeanours and escaped with just the sole booking from Felix Brych. In the latter stages of the game, Brych let Atleti off on several occasions as if trying to even things out, but the damage was done. Suarez should have been sent off earlier and at 10 versus 11, Barca’s advantage was significant. For his part, Luis Enrique said he thought Torres’s dismissal was clear. That may be so, but had he been deservedly sent off before Torres was or even later on, the Uruguayan would not have been there to turn this tie around. Suarez plays on the edge just like Atletico – and both he and Barca can count themselves extremely fortunate that his misdemeanours went unpunished on Tuesday.